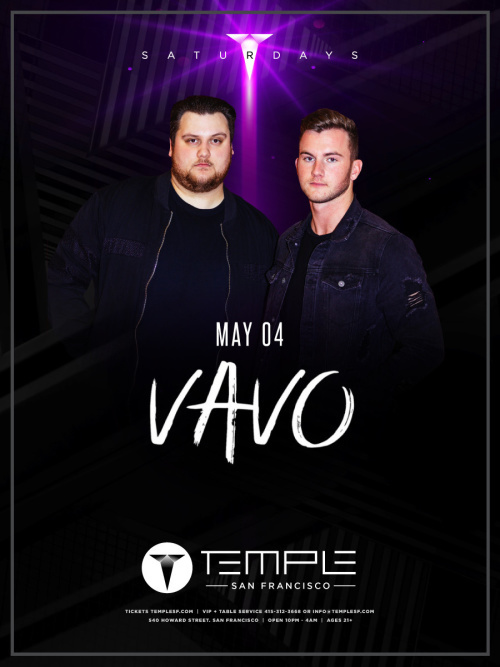 Billboard charting Dance/Pop duo VAVO seamlessly blends the talents of Vancouver native Jesse Fischer and London born Alden Martin. Despite once being separated by over 3000 miles, the duo found a way to work on music remotely and ultimately landed releases on major labels such as Republic Records and Musical Freedom (Spinnin Records). Their rise began in May 2017 when the duo released their reboot of "Astronomia" by Tony Igy. It quickly amassed millions of streams worldwide, charted on Spotify's Top Viral 50 in multiple different countries, and charted on multiple other platforms as well. After being heavily supported by Tiesto, the duo was then invited to collaborate with producer John Christian to have a song featured on his CLUBLIFE Vol 5 Special Japan Edition album. Meanwhile, at the same time, the duo was also invited to work on multiple remixes for Republic Records. Later regarded as an "artist to watch in 2017" by sources like EDM Sauce, VAVO hit the studio and closed out the year with a guest mix on CLUBLIFE by Tiesto. Come 2018, VAVO wanted to show the world that this will be an even bigger year. Kicking it off, the duo released their single 'How Low' on Musical Freedom Records, which quickly landed the #2 spot on Beatport's Top 100 Electro House Chart. As a result, they earned the support from dance music's biggest names like David Guetta, Tiesto, and Nicky Romero. Although successful, the duo stayed true to their genre defying reputation and began experimenting with new sounds. This led to the release of an official remix of Not A Love Song on Republic Records., which ultimately got the attention of Sirius XM BPM. With such a strong response to the remix, VAVO redefined their brand and saw their audience grow significantly. Now releasing on KESS Records, VAVO put out their first original in new direction called "Sleeping Alone." With fans and tastemakers around the world taking well to this, "Sleeping Alone" ended up becoming a BPM Breaker; the #1 Most Added Dance/EDM Song of The Week on Music Choice; charting highly on iTunes, Spotify, and Apple Music in countries all over the world; and most importantly, charting on Billboard's Dance/Mix Show Airplay chart, making it their Billboard chart debut. Now with over 50 charting positions on iTunes, Apple Music, and Spotify, VAVO seeks to raise the bar. Their current single "Right Now" has already reached the top 10 in the BPM Top 20 Countdown and has been supported by key tastemakers in the dance music community. At their current pace, expect to see VAVO rise up as one of the hottest dance acts in 2019.